More than 1,300 people are still trapped in remote mountainous villages in southern Taiwan, victims of treacherous mudslides and floods from Typhoon Morakot, the country’s semiofficial Central News Agency said Saturday. Rescue officials quoted by the news agency said 1,373 were still trapped and 75 helicopters were scheduled to conduct rescue missions Saturday in the counties of Kaohsiung, Pingtung, Taitung and Chiayi. The storm hit last weekend, dropping 2.6 meters (102 inches) of rain on Taiwan. After hitting Taiwan, Morakot roared on to mainland China on Sunday, killing at least six people and displacing 1.4 million, authorities said. The toll was much higher in Taiwan, where the storm was blamed for killing at least 121 people. 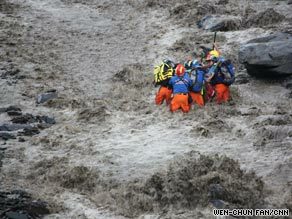 Torrential downpours, dense fog, rugged terrain and raging rivers have made it difficult on rescuers in Taiwan. Washed-out roads and bridges rendered rescue operations impossible in the central and southern regions of the island, the National Disaster Prevention and Protection Commission said. Mudslides flattened some places in southern Taiwan, including the small village of Shiao Lin. Authorities believe that as many as 200 people could Shiao Lin, a woman cried as she viewed the flattened plain of mud where homes once stood. “All of my relatives — including my older brother — are gone,” said Shiao Ling resident Luo Yong Ling. “Only my brother’s son is alive. More than 10 of my relatives and just one left.” Rescuers tried to determine Friday whether the mud was stable enough to bring in excavators to begin searching for bodies in Shiao Lin.